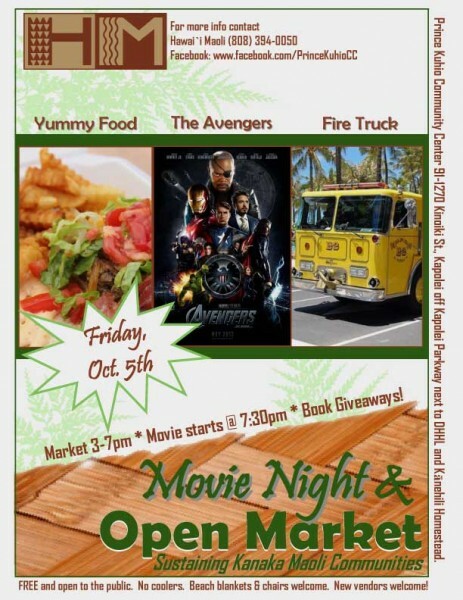 Get ready for open market and MOVIE NIGHT! On October 5th we’ll be showing The Avengers on the big screen under our big, white tent. Bring your family and friends to this wonderful event. Remember, this event is FREE and open to the public. Beach chairs and blankets are welcomed. Please, no coolers. The Prince Kuhio Community Center is a smoke and alcohol free facility. We’ll have food, the Kapolei Fire Department’s fire truck and book giveaways from August Ahrens Elementary School’s Library. Please feel free to share this information with everyone you know. We look forward to seeing you all there!